Upon returning to Hong Kong from my tropical vacation in the Phillipines, I immediately launched into a few days of intense eating. My stay in Hong Kong was brief and there was endless number of traditional snacks I wanted to sample. Lacking an expandable stomach, I had to pick and choose carefully. Here is a run down of many of the delicious food I enjoyed in those few days. I think it is also a pretty good pictorial guide of what traditional Hong Kong snacks is all about. Despite the hot temperature outside, I was craving a nice bowl of noodle soup after I got off the plane. Fish balls with rice noodles (魚蛋粉) and deep fried fish skin (鮮炸魚皮) were obvious choices. In Wanchai, there are many Chiu Chow-style noodle shops specializing in these dishes. The reason that these two dishes go hand-in-hand is because any restaurants worth their salt should make the fish balls from scratch, down to filetting the fish. Of course fish come with skin attached so deep fried fish skin is a great way to stretch every penny out of the ingredient. The fish skin are crunchy and makes for great accompaniment to the noodle soup. I personally like to dunk the fish skin into the bowl of broth to soften it just a tiny bit. Good quality fish balls should be bouncy from the rigorous mixing that brings out the elasticity from the flesh of the fish. The contrast of texture with slurpy rice noode makes this one of my favourite comfort food. 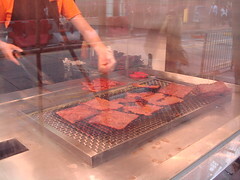 At one time, beef jerky (牛肉乾) and pork jerky (豬肉乾) are probably one of the most popular snacks among Hong Kong expats to try to smuggle back to Canada. I can't recall how many stories I heard over the years of friends being stopped by the custom officers and had their stash of jerkys confiscated. This is not without reason though because good jerkys are so delicious with their unique combination of sweet, spicy, salty, and smoky seasoning! As someone with a bit of a sweet tooth, I love the sticky caramelization of the light sauce over the piece of meat and of course the chewy texture. When I was a kid, jerkys were pricy junk food that my parents would not keep in the house. I have fond memories of munching on these snacks at my grandparents' house...I felt so spoiled. :) I bought a piece each of the beef and pork variety at Bee Cheng Hiang (美真香) in Causeway Bay where curious tourist can check out the jerkys getting freshly grilled. Although Bee Cheng Hiang is a Singapore company, jerkys are their specialty and the great thing is you can buy them by weight. On days when you just want a little snack to satisfy your craving, it's perfect. You can find waffles everywhere in the world so what's so special about Hong Kong-style waffles (格仔餅)? The difference is in the topping! A good waffle should be freshly made (obviously) so that its warmth would render the peanut butter, condensed milk, and granulated sugar to just be on that side of runny. Typically, the waffles are about twice the size of an Eggo waffle and the vendor would fold it in half to keep all the topping in place. As for where to find them? Just simply follow your nose! 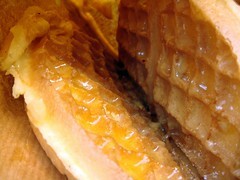 The fragrance of freshly grilled waffles is irresistable. Look for the vendors with crowds of school girls getting their after-school snacks and you can't go wrong. Trust me, these girls know where the good stuff are! A word of caution: keep the waffle horizontal when you eat it! Otherwise, you risk having all the topping sliding out of the waffles and into the paper bag, your hands, your clothes, the ground...not that I'm speaking from experience of course. You can't mention waffles without mentioning its closely-related cousin Gei Dan Jai (雞蛋仔), a snack that many Hong Kong children grew up with. Imagine a waffle...except that it's shaped like a round of oversized bubble wrap. They are the perfect size to tear off one by one and feed into the mouths of impatient little kids (or adults alike...)! To me, this is a pretty pedestrian food until I had my revelation at 利強記北角雞蛋仔. This is probably one of the most famous vendors in Hong Kong for Gei Dan Jai and they certainly have the line ups to prove their popularity. Their Gei Dan Jai had a crunchy exterior and a custardy eggy interior. What have I been missing all these years?! Like waffles, you can smell the sweet fragrance even far far away (why don't we have smell-O-blog?). If you look at the picture carefully, you will notice that the paper bag is perforated to let the steam escape. Thoughtful and clever! While I was lining up and waiting for my order, I took the liberty to capture a series of pictures showing the vendor handily making six different batches all the same time. Enjoy! Speaking of nostalgic snacks, someone with an entrepreneural spirit opened such a specialty store in Wanchai called 砵仔王. The snacks sold there are not made at the store. 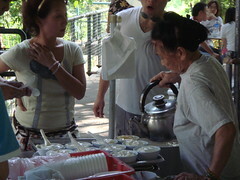 Instead, they are delivered from respective vendors around the city specializing in each different snack. It is a convenient one-stop shop for someone like me who was short on time but big on appetite! 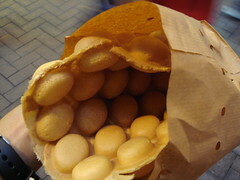 I sampled a couple of things including crepe-wrapped wafers (糖荵餅) and fluffy steamed cake(鬆糕). 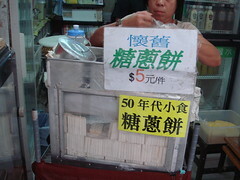 Street vendors selling crepe-wrapped wafers is a rare sight in Hong Kong now. I remember when I was a kid, I used to see old men toting around a large metal case with clear plastic front containing the wafers. They would set up shop at busy street corners with a little folding stool set beside the metal case. When you place an order, he would carefully take a piece of crepe from underneath a moist tea towel. A wafer would be placed in the middle of the crepe along with sprinkling with sugar, roasted sesame seeds, and shredded coconut. The whole thing would at last be rolled up into a tight little packet. Biting into it would yield a multitude of texture...a bit of chewiness from the crepe, a crunch from the wafer, and of course a bit of crackle from the sesame seeds and sugar. I love this traditional snack even now that I am all grown up. All things retro can be made trendy given the proper packaging and that cannot be more true for this next snack. Maltose is a thick syrup that is no longer popular in the home kitchen for the last couple of decades. However, back in the harder times of yesteryear, it was a humble and economical treat. One way to enjoy it is to sandwich a dollop of maltose between two pieces of saltine crackers. At the Wo Kee Loong Gift Shop inside the Ngon Ping Village, you can have a taste of this retro snack in an almost no-mess kind of way. 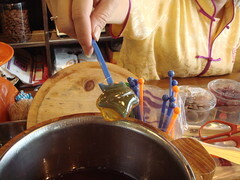 A stir stick is used to twirl the maltose before being sandwiched between the crackers. You can eat the whole thing like a popsicle without worrying too much about dripping syrup. However, if you really really really do like this snack, you can even purchase a kit from the store with stir sticks, crackers, and a little container of maltose. In the last centry, there was a large influx of Chiu Chow immigrants to Hong Kong therefore Chiu Chow cuisine is deeply ingrained into the Hong Kong food culture. If you crave Chiu Chow-style dumplings, Tsang's Dumpling (曾記粿品) is the place to go. This little shop is tucked inside the food court level of a non-descript market but before they moved to this current location, they've been in the business for many years. While I was there, I saw many people came to purchase ready-to-cook dumplings in various flavours and chatted with the grandmother, mother, and daughter team manning the shop. For the non-cooking inclined, you can order dumplings in multiples of three and have the shop pan fry them for you to enjoy on the spot. There are savory as well as sweet dumplings. I chose a chive, a daikon, and a sweet taro dumpling and I must say the savory ones were much superior. The wrapper was thin as can be, eveloping juicy flavourful fillings. Sure they were greasy but the good caramelization from pan frying made the dumplings so much better! 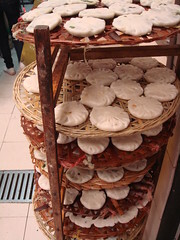 The sweet dumplings used a different kind of dough for the wrapper and it was much more similar to sticky glutinous rice cakes. This place is a little off the beaten track and the ambiance leaves much to be desired. However, for an authentic taste of Chiu Chow, it's quite a gem. You can find the location of these places in my map.